Artifacts or Geofacts? Alternative Interpretations of Items from the Gulf of Cambay. "Artefacts brought up by dredge from 40 metres depth from the suspected city structures in the Gulf of Cambay, north-west India." Without the benefit of any detailed peer-review or publications in scientific journals, much has been made about the significance of these alleged artifacts from the bottom of the Gulf of Cambay. The significant problem with both press releases and web pages that describe these items is that they provide little, if any, hard data that authenticates the identification of these items as valid artifacts or bones. Despite the giddy claims of either a "Lost" or an ancient Indian civilizations as described in Vedic literature, some caution needs to taken by the various parties in the making the claims being made about these items. Given the significance of the claims being made for artifacts recovered from the Gulf of Cambay, remarkably little, if anything has been published. As of the time that this article was written, nothing has been published in any scientific literature about these artifacts. At this time, the only known source of pictures had been newspaper articles, popular books (Hancock 2002a), and web pages (Hancock 2002b). Being an experienced archaeological geologist familiar with lithic materials used to prepare artifacts and concretions created by both pedogenic and marine processes, these artifacts naturally attracted my attention. However, an examination of the artifacts illustrated by Hancock (2002b) generated a considerable skepticism my part as to whether many of these so-called "artifacts" illustrated by Hancock (2002b) are really artifacts. "Ridged or turned effect on outer surface, looks as though it could have been turned on some sort of lathe. There is a hollow passage through the middle, possibly drilled." Looking at the pictures that Hancock has posted at the above URL, Hancock greatly overstates the regularity of the surface. Although ridged, the profile of this object undulates quite irregularly. Also, the ridges are neither as continuos nor formed as a machined object should be. Furthermore, Hancock (2002b) seems to be unaware that concretions known to be natural, not man-made, show the same "ridged or turned effect" that he described above. For example, Figure 1 illustrates Pleistocene concretions that occur in glacial lake deposits along the Fraser River near Endako and Quesel, Canada that exhibit identical, if not better formed, "ridged and turned effect" that Hancock (2002b) presumes to be indicative of man-made origin. In addition, these concretions exhibit symmetry that is superior to any of the objects he illustrates in the first three items. Innumerable carbonate concretions, like the ones illustrated in Figure 1, occur in exposures of laminated, Pleistocene glacial lake silts within Central British Columbia. One of the best localities for finding these concretions is the "Big Slide", a large landslide that exposes laminated lake silts a few kilometers north of Quesel, British Columbia (Clague 2002). Clague (1987) described the laminated silts in which these concretions occur in detail. Figure 1, Natural carbonate concretions from near Endako, British Columbia. Concretion in upper right corner is 4 cm long. Reproduce from Plate 7 of Kinder (1923) with permission. "Overall appearance of this object indicates it was manufactured or created by hand rather than having been formed by natural forces within the environment." It making this statement, Hancock (2002b) overlooked the fact that the cementation of thinly laminated sediments, as in case of the above calcareous concretions, can produce a ridged cylindrical concretion like Item 1. 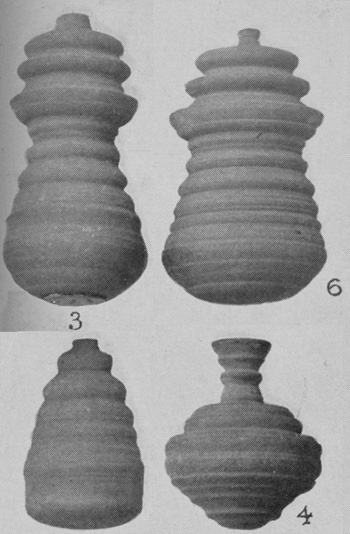 As illustrated in Figure 1, concretions of undoubted natural origins exhibit a development of ridges and symmetry far superior to any of the objects that he hypothesized to be artifacts. Despite their well-developed ridges and superior symmetry, these concretions are without question concretions of natural origin. The concretions from laminated lake silts near Endako and Quesel, Canada refute the interpretation of Hancock (2002b) that the overall appearance of Item 1 is any indication that it is man-made. The ridges on Item 1 can be explained by the precipitation of some sort of cement around a pre-existing burrow within either flat-laminated or cross-laminated sand. The hole in the specimen, which is remarkably off-centered for a drill hole, as interpreted by Hancock (2002b), is the burrow itself. The ridges on the specimen represent individual sand laminae of the sand bed penetrated by the burrow. The distance that each ridge extends from the burrow reflects the texture of the sand laminae. 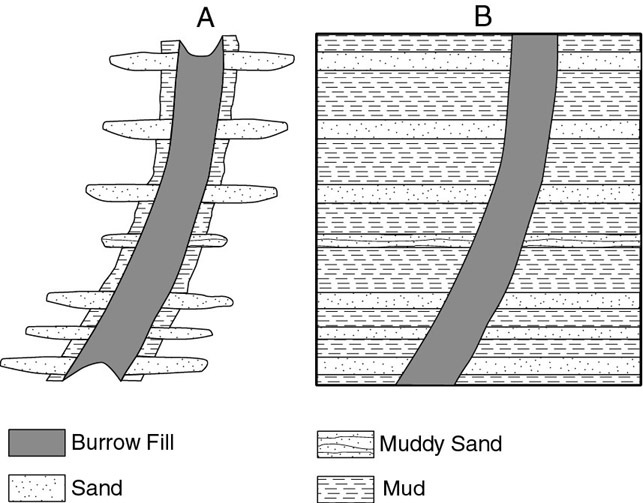 The coarser laminae would extend further from the burrow than the finer sand laminae because the greater porosity would allow the cementation of the laminae it to penetrate further away from the burrow. A hypothetical cross-section of Item 1 is shown in Figure 2. Figure 2: Hypothetical cross-section of Item 1 illustrating its internal structure. As interpreted in Fig 1., Item 1 of Hancock (2002b) is also intriguing in that its layers of laminated "coarser sand and laminated "finer" sand alternate on a centimeter-scale. 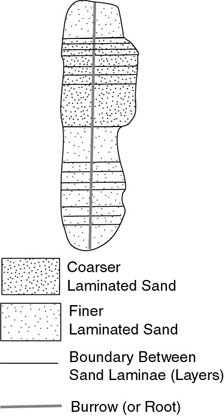 The smooth curve of the alternating "coarser sand and "finer" sand indicate that laminae likely become progressively coarser, reach a maximum grain size, become progressively finer, reach a minimum grain size, and than then become progressively coarse in a repeating cycle. Unfortunately, the photographs are not clear enough to count the number of laminae within each cycle but it appears to be in the range of 10 to 20 laminae. This is intriguing as 14 laminae coarsening to fining cycle would be characteristic of centimeter-scale tidal deposition representing the daily deposition of laminae between Slack Tide (the "finer" sand) and Neap Tide (the "coarser" sand). In such a case, the sine wave-like form of Item 1 ultimately reflects cyclic variations in grain size of laminae as a result of tidal deposition. The variations in grain size control the cementation of this sand and produce a concretion with a wavy surface. According to the available information, e.g. Gupta (2002), there exist several potential sources of such a nodule, specifically a carbonate nodule. Gupta (2002) noted several potential sources of concretions, specifically carbonate concretions, presence of carbonate-cemented sediments (caliche ?) containing calcified root casts (rhizo-concretions and rhizoliths) underlying the bottom of the gulf and the presence of calcareous sandstone in samples that they dredged from the bottom. The carbonate-cemented sediments, rhizoliths, and calcareous sandstone could very easily be the source of this and other of the concretions that Hancock (2002b) illustrates. Finally, numerous authors, e.g. Brown and Farrow (1978) and Pope et al. (1990), have documented the cementation of burrows in underwater environments by the precipitation of carbonate as the result of fermentation of either sedimentary organic matter and microbial oxidation of either biogenic or thermogenic methane. This is very likely another concretion, Item 1, which is discussed above. Item 2 is also illustrated by Sen (2002:Fig 3c) as a possible stone bead. Looking at Item 2, a person can see surface striations, although at a finer scale, like Item 1. As in case of Item 1, the striations could represent laminations of laminated sand, in which the nodule developed. The laminations can be seen because cementation of the sand progressed further out from the center of the nodule within relatively coarser-grained laminae than in finer-grained laminae. The short segment of the item that is thicker than the rest of the nodule represents the coarsest and, thus, most porous of the sand laminae penetrated by the burrow or root. This is illustrated by Fig 3. Figure 3: Sketch showing hypothesized internal structure of Item 2. The coarser laminae because of their greater permeability are cemented further from the center of the item (concretion). In Figures 4 and 5, segments of a carbonate concretion from High Island, Texas shows the same general cylindrical shape as Item 2. The High Island concretion lacks the surface striations that Item 2 possess because instead of forming in laminated sand, it formed within rather homogenous silty clay. Figure 6, Sketch showing hypothesized in internal structure of Item 3. Part A of this figure shows the concretion after the sand, muddy sand, mud, and burrow fill has been cemented. Part B shows a block of bottom sediment with the layers of sand, muddy sand, mud, and burrow fill before the burrow and surrounding sediment has been cemented and the uncemented sediment eroded from around it. "Group of four objects including tooth, ivory bead and spoon." Because of the small size of the objects, it is difficult to identify many of the items. As indicated by Sen (2002:Fig. 3a), the middle object appears to be a very badly worn tooth. The "tooth" is very badly worn and obviously has been rolled and tumbled by both cyclone and tidal generated bottom currents for a long period of time. As discussed below for the Roman era pottery found at the bottom of the Gulf of Cambay within the area surveyed, the presence of human teeth and even other remains is not at all surprising and even quite predictable. Because innumerable people have been either drown by the storm surges of tropical cyclones or drowned in shipwrecks within the Gulf of Cambay, it is not at all surprising that human remains of any type can be found in the area surveyed for archaeological remains. Once either swept out to sea or sunk in shipwrecks, such human remains, including small objects like teeth will be widely distributed by the strong currents associated with the backflow of the storm surge and the tidal currents that characterize the Gulf of Cambay. Similarly, small objects such as spoons and beads could very be introduced into the Gulf of Cambay by either shipwrecks or the backflow of cyclonic storm surge and redistributed around the bay by tidal currents. Item 5 of Hancock consists largely of objects, often of irregular shape that are characterized by a central hole in them. Such objects, called "Cambay pedants" by an archaeologist friend, are not man-made objects. The variety and irregularity of the objects are consistent with them being natural concretions. Even the circular holes these flat objects have are found in naturally formed concretions. Where they have been either bored by marine organisms or formed around either burrow or roots, the holes can be remarkably round as illustrated in Fig. 3d of Sen (2002:387). Other examples of similar concretions can be seen at NIOT (2002). 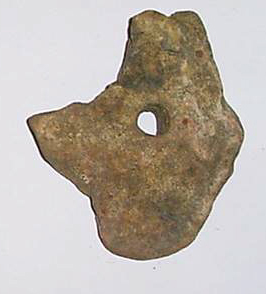 Virtually identical objects, complete with holes and shapes illustrated by Hancock (2002b) and Sen (2002), can be found in many places along the Texas and Louisiana coasts and elsewhere, Fig. 7. Along McFaddin Beach near High Island, Texas, natural concretions virtual identical to the "Cambay pedants" can be found loose on McFaddin Beach as seen in Figure 7. Fig. 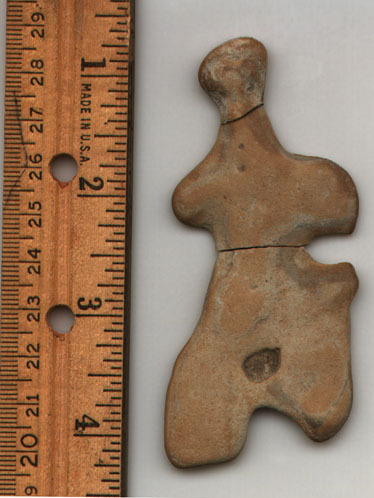 8 shows a pseudo-effigy created by a flat type of nodule that also occurs in irregular shapes and holes as the "Cambay pedants". Fig. 9 shows a geometric design in a natural concretion of the same type that also forms the "Cambay pendants". "Cambay pedants" occur widespread and have been found at widely separated places as Lake Texoma, Texas and, as illustrated by Kinder (1923:plate 10), the valley of the Ottawa River in Ontario as shown in Figure 10. Because the nodules from High Island, Texas form by the cementation of fine-grained sediment, including clay and silty clay, they often can be indistinguishable from pottery to the point of confusing the most expert archaeologist. As I have time, I will make pictures of other "Cambay pendants" and post them to a "Cambay pendant" web page. 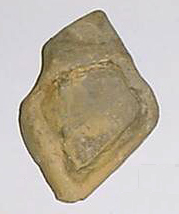 Figure 7, Concretion from beach at High Island, Texas showing form of "Cambay pednants". Long axis of this concretion is about 7 cm in length. 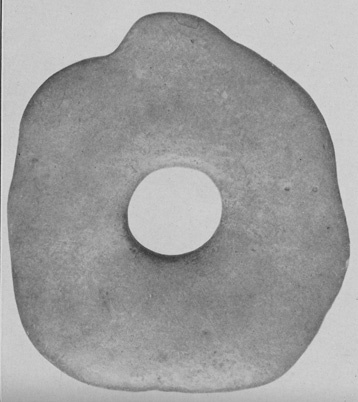 Courtesy and copyrighted by Mr. David C.
Figure 9, Another flat concretion from High Island, Texas that exhibits geometric designs that could be mistaken for etching. Long axis of this concretion is about 5cm in length. Courtesy and copyrighted by Mr. David C.
Figure 10, Pleistocene carbonate nodule from the Ottawa River Valley, Ontario, Canada. Maximum width of this concretion is 8 cm. Reproduce from Plate 10 of Kinder (1923) with permission. "Reddish pottery fragments set within stony matrix." "The pottery pieces seem to belong to the early two centuries of the Era establishing the fact that there was a settlement here which was engaged in the Roman Trade. There are several such sites on the Gujarat Coast, the pottery from which also indicate the same." The presence of Roman pottery indicates that the some of the sandstones and conglomerates are not Early Holocene fluvial deposits as suggested by Gupta (2002). Rather, its presence would indicate that some of the gravel sands and sands at the bottom of the Gulf of Cambay are more likely gravelly lags created by an initial episode of shoreface erosion and repeated reworking of the gulf bottom by tidal currents. The underwater cementation of such deposits, after the pottery was incorporated into them, can be explained by the precipitation of carbonate cements caused by the fermentation of either sedimentary organic matter and microbial oxidation of either biogenic or thermogenic methane. The ability of organic matter fermentation and methane oxidation to produce lithified deposits either of sandstone, coquina, and mudstone in an underwater environment is demonstrated by Howard (1990), Stakes et al. (1999), Pope et al. (1990), and Jorgensen (1992). The presence of Roman era pottery among the artifacts collected from the area of the alleged Cambay "sites" also demonstrates widespread dispersal and mixing of artifacts of a wide variety of ages across the gulf bottom within the area examined. The introduction of the artifacts could have happened by two major processes. First, given the extensive nautical traffic that has occurred throughout the Gulf of Cambay over the millennium, it can be assumed that numerous vessels have sunk. After sinking the disintegration of these vessels and their contents would have released considerable numbers of artifacts of various types and ages into the Gulf of Cambay. After, their release, currents, at velocities as much as 3 to 4 km per second, would have redistributed smaller artifacts over the Gulf of Cambay. In case of pottery, a relatively light material in terms of density, such currents are quite capable of moving large pieces of pottery long distances over just a few decades. Heavier objects would be concentrated as a bottom lag of gravel size material. Finally, the Gulf of Cambay is subject to intense tropical cyclones. Such typhoons generate very strong storm surge that erode and scour the coast and can wash large portions of entire villages out into the Gulf of Cambay. The storm surge might erode and transport fragmented pottery, small artifacts, and other artifacts attached to wooden infrastructure. Although these storms fail to generate geostrophic currents within the Gulf of Cambay, the backflow of the storm surge after the storm has passed creates a temporary movement of water from the land into the gulf. This backflow can move such debris offshore into the gulf immediately after the cyclone has pasted. Once in the Gulf of Cambay, the pottery and human remains, including teeth, can further scattered all over the Bay of Cambay by strong tidal currents. As a result, whatever grabbed from the bottom is a mixture of rocks, teeth, and artifacts from wide variety of sources and ages that typically lacks an interpretable archaeological context. The abundance of reworked Roman pottery is such strong proof of this problem. At http://www.grahamhancock.com/underworld/cambay3.php?p=7, Hancock (2002b) identifies Item 7 as: "Possible carving representing the neck and head of a deer or other animal." From what can be seen in the photograph, this is likely another sandstone, likely carbonate, nodule as described above. The observation that appears to be "symmetrical" is a useless criterion as even naturally formed concretions can be symmetrical. It is curious that Hancock (2002b) lauded the skill of the carving although the alleged carving is so vague and formless that it can't be identified to the type of animal being carved with any certainty. "Not for nothing are these commonly called 'hieroglyphs' as they are a trap for the unwary." The badly worn nature of this slab makes identification of the precise trace fossil genera difficult from photographs. Two possibilities are the trace fossil genera Planolites and Palaeophycus. Both Planolites and Palaeophycus are trace fossils created by the feeding process of worm like invertebrates. The burrows of each genera are straight to gently curved, cylindrical or nearly cylindrical. Both burrows are either more or less horizontal, or oblique to bedding planes as they course through the sediment in irregular courses. The path of each burrows may cross each other, but neither genera branches. Palaeophycus differs from Planolites in that the burrows of the former are unlined while the burrows of the latter are lined. Figure 8 illustrates the bottom of slab covered by Planolites sp. Figure 11, Bottom of slab showing abundant Planolite burrows from the Chalk Canyon formation of New Mexico. From Schur (2000) with permission. My first job as a "Geologist and Geomorphologist" / archaeological geologist for a Cultural Resource Management (CRM) company involved writing the chapters on the natural setting and archaeological geology of the survey area in George Washington National Forest, Virginia. Because they were short of field "grunts", they "drafted" into helping with field survey work. Just before I arrived, they made one of the great "finds" of survey work, which was described to me as a marvelous panel of "rock art" lying inside a low rock shelter within the survey area. Naturally, they had prepared great plans the take the National Forest Service archaeologist to look at it and even release a press release, about having found such a major piece of rock art in this part of Virginia. However, the picture abruptly changed when the crew, with which I was working, decided to take, with the permission of the boss, a long lunch break so that everyone in the crew could have a look at the newly found "rock art". Needless to say, I just about had a heart attack when we got to the "site". Immediately upon viewing the "rock art", it was quite clear that the "rock art" lay not only on a bedding plane but also continued into the outcrop. Also, the "rock art" consisted of a rounded furrow made when the sediment was soft, which in a few places, still contained cylindrical pieces of the lithified sediment that still filled its spiral track. It was quite clear that the "rock art" was in really the spiral track of Paleozoic marine invertebrates. Of course, it took a lot of documentation to argue my case, being the bearer of highly unwelcomed news. Fortunately, everyone involved was open-minded to listen to my arguments. In this case, trace fossils had confused a group of well-trained professional archaeologists consisting of two Ph.Ds and three M.Ss in archaeology. The problem was not that any of these people were stupid. In fact, they were quite intelligent people. The problem was that the schools, which they had gotten their education, had no way of predicting that studying the esoteric branch of paleontology involving trace fossils, ichnology, would be of any benefit to their students. Also, detailed discussions and illustrations of trace fossils can be found in Bromley (1996) and Ekdale (1992). "A piece of wood amongst the artifacts (photographs below) was carbon dated at two different laboratories - one giving a date of 8500 years ago and the other of 9500 years ago." "The carbonised wood pieces recovered were taken up for dating using C14 technique in the Birbal Shahni Institute of Palaeo Botany, Lucknow and in National Geophysical Research Institute, Hyderabad. Preliminary results of the analysis of samples have revealed that the age range was between 8150 and 7680 years before present (BP) (by the Birbal Shahni Institute) and 9910-9330 years BP (by the National Geophysical Research Institute, Hyderabad)." First, there is a significant problem with the provenience of this specimen. According to the available reports, this piece of wood was simply dredged off the bottom of the Bay of Cambay. There is no evidence that this piece of wood was in anyway associated with either any alleged ruins or alleged artifacts. There is no of knowing whether this piece of wood was eroded from Holocene coastal or fluvial deposits and transported into, and reburied by tidal currents where it was later found or was buried in situ. Even if the radiocarbon dates from this piece of wood didn't contradict each other, it is still unknown what exactly this piece of wood dates. It is well documented that the presence of organic material yielding radiocarbon dates inconsistent with sea level curves within the sediments of the western inner continental shelf of India, of which the Gulf of Cambay is an extension, is both a very common and significant problem as documented by Mascarenhas (1997). Thus, the radiocarbon dates obtained from the piece of wood illustrated by Hancock (2002b) are virtually meaningless in any interpretation of material found in the Gulf of Cambay. Second, Hancock (2002b) overstated the age of the youngest sample. The date of 8500 BP that he provides above is clearly too old for the 8150 to 7680 BP by almost 600 years of the date provided by Gupta (2002). This is significant because this error minimizes the considerable difference in age between the dates obtained by the Birbal Shahni Institute of Palaeo and the National Geophysical Research Institute. Finally, neither of the dates of the Birbal Shahni Institute of Palaeo and the National Geophysical Research Institute overlap within the range, presumably a standard deviation of the actual date. The youngest and oldest of the ranges given above differ by as much as 1,650 to 1750 years. Given the small size of the piece of wood dated, it is unlikely that dating different parts of the wood, e.g. heartwood versus outside rings can explain this different. Two distinctly different dates from the same piece of wood likely means significant problems either with the sample that was dated or problems with the process of dating of the wood occurred. It is possible that either one of these dates or neither accurately reflects the age of the sample but until other dates are done from this piece of wood, the interpretation of either date remains uncertain. Also, it is difficult, if not careless, to interpret any date without information concerning the counting times, carbon isotope values, species of wood, and other important data having been released. For example, knowing whether the dated plant fragments or wood is from a C3, C4 or CAM plant can be useful information. If the ratio of carbon isotopes that characterizes either a C3, C4 or CAM plant is inconsistent with the paleobotanist's identification of the plant, the radiocarbon date is clearly problematic and potentially erroneous. In this case, the archaeologist should report and discuss the implication of the problem. It must be remembered, that it can be quite easy and is quite common for nongeologists to be confused by natural rock formations. When confronted with natural phenomenon they are unfamiliar with, even the best of scientists can be mislead. A case in point in which I was personally involved concerned some magnetic anomalies found off of Breton Island, Plaquemines Parish, Louisiana. On the basis of very well defined magnetic anomalies, it was presumed that submerged shipwrecks existed offshore of Breton Island at five locations. Preliminary testing of these magnetic anomalies found no evidence of cultural material, except large concentrations of calcareous nodules that possibly could be interpreted as ballast. A detail study of the nodules showed that they were far too soft to have been ballast and based upon radium isotopes were far to young, only five to eight years old, to be the result of historic shipwrecks. Petrographic and isotopic analyses of the alleged ballast showed it to be carbonate concretions created by the precipitation of calcium carbonate as the result of the oxidation of methane seeping from underlying sedimentary strata. It was determined that these concretions were also magnetic from the formation of magnetic iron-bearing minerals contemporaneous with the precipitation of the carbonate minerals. The result of the investigations clearly showed that what well-trained archaeologists interpreted to be magnetic anomalies and ballast associated with shipwrecks, in fact, were "pseudo-shipwrecks" created by natural processes associated with the degradation of hydrocarbon seeping naturally into the sea floor (Irion and Heinrich 1986). For a classic example of people confusing natural concretions with man-made objects, go read Heinrich (1996), "The Mysterious Origins of Man: The South African Grooved Sphere Controversy". Gulf of Cambay can be found in " Flooded Kingdoms of the Ice Age: A Review of Part II" by Nic Flemming at:"http://www.hallofmaat.com/modules.php?name=Articles&file=article&sid=36". This and other topics concerning archaeology are discussed on the messageboard at "In the Hall of Ma'at" web page. Bromley, R. G., 1996, Trace Fossils: Biology and Taphonomy. 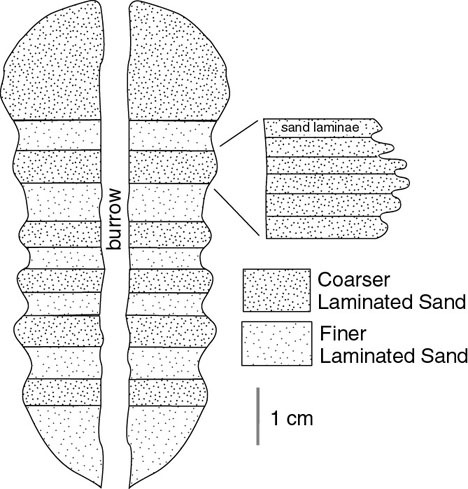 Special Topics in Palaeontology, London, Unwin Hyman, 280 p.
Brown, B. J., and Farrow, G. E., 1978, Recent dolomitic concretions of crustacean burrow origin from Loch Journal of Sedimentary Petrology. vol. 48, no. 3, pp. 825-833. Clague, J. J., 1988, Quaternary stratigraphy and history, Quesnel, British Columbia. Physique et Quaternaire. vol. 42, no. 3, pp. 279-288. Clague, J. J., 2002, personal communications, May 3, 2002, Dept. of Earth Sciences, Simon Fraser University, Barnaby, British Columbia. Ekdale, A. A., 1992, Muckraking and mudslinging: The joys of deposit-feeding. In Maples, C. G., and West, R. R. (eds. ), Trace Fossils. Short Courses in Paleontology No. 5, Paleontological Society, Knoxville, Tennessee, p. 145-171. Hancock. G, 2002a, Underworld: Flooded Kingdoms of the Ice Age. Penguin Books, London. Hancock, G., 2002b, Artefacts from the Gulf of Cambay. Graham Hancock. April 23 2002, last visited May 5, 2002. Heinrich, P. V., 1996, The Mysterious Origins of Man: The South African Grooved Sphere Controversy. Talk.Origins Archive. April 8, 1996, last visited May 5, 2002. Howard, R. O., Jr., 1990, Petrology of hardbottom rocks, Mississippi-Alabama-Florida continental shelf. Unpublished Master's thesis, University of Alabama. Tuscaloosa, Alabama. Irion, J., and Heinrich, P. V., 1986, Phase II Cultural Resources Investigation of Submerged Anomalies, Breton Sound Disposal Area, Plaquemines Parish, Louisiana. Report by R. Christopher Goodwin and Associates, Inc., New Orleans, Louisiana under Contract Number DACW29-92-D-0011, Delivery Order 0003, for U.S. Army Corps of Engineers, New Orleans District, New Orleans, Louisiana. Jorgensen, N. J., 1992, Methane-derived carbonate cementation of marine sediments from the Kattegat, Denmark: Geochemical and geological evidence. Marine Geology. vol. 103, no. 1-13. Mascarenhas. A., 1997, Significance of peat on the western continental shelf of India. Journal of the Geological Society of India. vol. 49, no. 2, pp. 145-152. NIOT, 2002, More Artifacts. April 2002, last visited on May 3, 2002. Neil K., 2002, Letters: Archaeological Finds in Bay of Bengal - Part Two. Oceansp@ca, The FREE online marine science & ocean technology newsletter, No. 402, February 14, last visited May 5, 2002. Poppe, L. J., Circe, R. C., and Vuletich, A. K., 1990, A dolomitized shelfedge hardground in the northern Gulf of Mexico. Sedimentary Geology. vol. 66, no. 1-2, pp. 29-44. 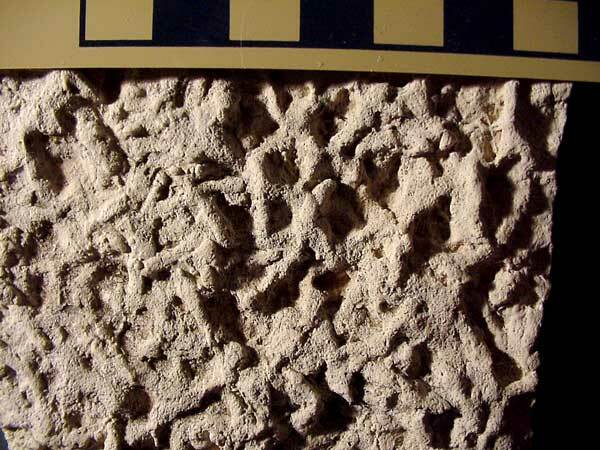 Schur, C. 2000, Trace Fossils and Sedimentary Structure of the Miocene Chalk Canyon Formation. April 1, 2000, last visited May 5, 2002. Sen, N., 2002, The seabed reveals artifacts, Will India now hone its skills and tools for diving into the realm of marine archaeology? Current Science. vol. 82, no. 4, p. 395. Stakes, D. S., Orange, D. L., Jennifer, B., Salamy, Karen, A., and Maher, N., 1999, Cold-seeps and authigenic carbonate formation in Monterey Bay, California. Marine Geology. vol. 159, no. 1-4, pp. 93-109. Go to Bathymetric map covering part of the Gulf of Cambay (Khambhat). For some reason, Netscape Navigator shows the complete map, while Explorer doesn't show the full map. Copyright (c) 2002 Paul V. Heinrich All rights reserved.